I'm organic. Thick puree. No added sugar or salt - I contain naturally occurring sugars. No chunks and nothing artificial. Just yummy organic food for babies. I'm suitable for vegetarians too.Hello, I'm a yummy mix of organic macaroni + vegetables in a cheesy sauce. Who am I made for? 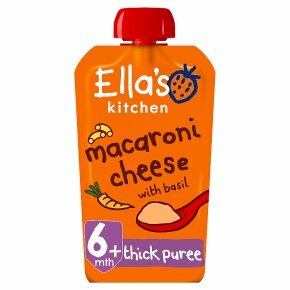 I'm great for babies who are ready to explore thicker textures and my ingredients are suitable from 6 months. The Government advises that foods containing protein should only be introduced to a baby's diet after 6 months. I'm suitable for vegetarians too.